Darren Coleman has over 20 years brand marketing experience spanning Europe, the Middle East, South East Asia and Japan. He counts Johnson & Johnson, BUPA, Maybank, Orange, Saudi Telecom Company, Ooredoo and PepsiCo are amongst the brands he has helped. Darren is frequently invited to deliver keynote talks at international conferences, moderate panel discussions and roundtables, sit on expert panel boards and comment on brand-related issues in national and international media. He holds an MA in marketing (University of Nottingham) and PhD in B2B services brand marketing (University of Birmingham, UK. He’s the Founder and Managing Consultant at Wavelength Marketing. Wavelength specialises in helping services brands retain relevance through experiences they build. 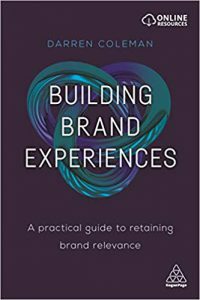 Darren has published Building Brand Experiences: A Practical Guide to Retaining Brand Relevance, with Kogan Page for global distribution and his book will be translated into Korean in 2020. Brand experience vs. customer experience. Some of my favorite episodes of the On Brand podcast have explored the definitions we use as brand builders. Darren kicked off the show by noting that we use these two terms — brand experience and customer experience — interchangeably when they’re actually two very different things. “Customer experience is what it says. It’s what the customer experiences.” Brand experience is about your context, your brand, and how you bring it to life. Who are some of Darren’s favorite examples? Virgin Atlantic (“Their CMO is passionate about the brand”) and Singapore Airlines. What brand has made Darren smile recently? Virgin Trains! Darren recently had a bad travel experience that they managed to recover. This too is part of developing a compelling brand experience. To learn more, connect with Darren on LinkedIn and check out the Wavelength Marketing website. This entry was posted in Podcast and tagged brand experience, customer experience, darren coleman, wavelength marketing. Bookmark the permalink.